As humans continue to build homes near wild areas, human-wildlife encounters are almost certain. Southwest Wildlife strongly believes that wildlife education is the best way to mitigate the impact of such encounters. If you have a wildlife question that is not addressed here, please contact us. There is a bobcat in my backyard, what do I do? 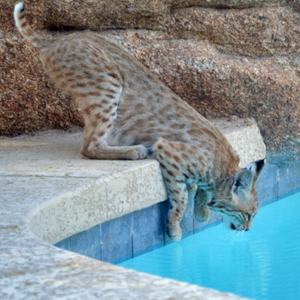 Although bobcats are generally not a threat to humans, they may prey on small pets. Small pets, including cats and small dogs, should never be left outside unattended. If they must be left outside, keep them in an enclosed area with a roof. To deter a bobcat immediately, make loud noises by banging pots, clapping your hands, or shouting. Also, try spraying it with a garden hose. If the animal is confined, open a gate, have all the people leave the area, and allow it to leave on its own. It if is still within the confined area the following day, or trapped inside a residence, contact Southwest Wildlife. If the bobcat remains around your property for more than a few days, you might want to check for kittens. If kittens are there, consider tolerating them for a few weeks until the kittens are large enough to leave the area with their mother. If you find only kittens and no mother, leave the kittens alone and observe them from a distance unless the young are obviously sick or injured. In most cases, the mother is off hunting and will return to her young. Do not feed bobcats, as this can encourage them to become too comfortable around humans. Removal of a wild animal should be a last resort. If it is necessary, consider calling a humane agency which will trap and remove animals for a fee. Contact Southwest Wildlife at our main phone number (480) 471-9109 and leave a message if you would like suggestions for humane trapping companies. Bobcats will be attracted to food, water, or shelter. Food may include birds, rodents, rabbits, small unattended pets, poultry or other domestic birds. They may get water from pools, birdbaths, fountains, and pets’ water dishes. Shelters that appeal to bobcats can include rooftops, attics, and the space underneath decks. Other small spaces can make attractive dens, and bobcats might even rest during the day or bask in the sun, so thick brush, shade, and unoccupied yards may attract them. 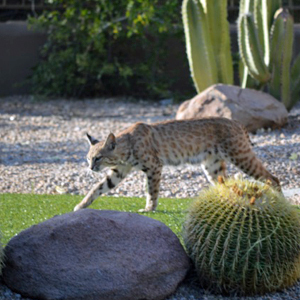 To prevent attracting bobcats to your yard, keep domestic animals (dogs, cats, chickens, rabbits, rodents, etc.) in a secured enclosure with a sturdy roof. Feed your pets inside, or remove uneaten pet food between feedings. Keep your landscaping trimmed up, removing low-lying vegetation to deny bobcats hiding cover. Bobcat prey will also hide in heavy cover so trimming your plants up will prevent hiding spots for the prey which will then prevent attracting bobcats. You can try to deny access to bobcats by putting up fencing; however, bobcats can jump up to 12 feet, so a 6-foot fence may not deter them if they are determined to get into the yard. You can try products which can be used as animal deterrents, but there are no repellents registered to control bobcats. The the variety of products sold to deter house cats from using gardens or flower beds will undoubtedly have some effect on bobcats. There is a coyote in my neighborhood. What do I do? You are far more likely to be bitten by a domestic dog than any wild animal. However, if you see a coyote near your home, don’t ignore it. This may cause it to lose its natural fear of people. To scare a coyote immediately, make loud noises by shouting, banging pots and pans, or by shaking an empty soda can filled with rocks. Wave your hands or objects like sticks and brooms, or try spraying the coyote with a hose. When walking your dog, never use retractable leashes, as they allow your dog to get too far away from you. If you are walking your dog and you see a coyote, try to keep your distance. Throw small rocks in the general direction of the coyote to try to scare it. 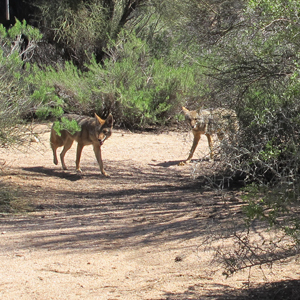 If you are walking a small dog, you may want to pick up your dog or change your route to avoid the coyote. If the coyote is bold and approaches you, try a commercial repellent like mace to deter the animal. Do not feed coyotes or other predators and make sure your neighbors are not providing food either. Feeding will only make the coyotes more comfortable around humans, and this can be dangerous for both the humans and the coyotes. It is also important to educate children about coyotes. Teach them what to do if they ever encounter a coyote and make sure they understand why they should never feed coyotes. Coyotes may be attracted to food, water, or shelter. Food can include unattended pets, birds or rodents attracted to bird feeders, pet food, garbage, or fallen fruit. Water sources can include a pet’s water bowl, swimming pool, or fountain, and shelter can include a storm drain or any cave-like area beneath a shed or unused building. Coyotes will keep coming back to the same area if attractants are not removed, so remove anything outside your home that may be attracting coyotes. Never feed coyotes, and encourage your neighbors not to feed coyotes or leave anything out that might attract the animals. Feed your pets inside, and never leave them unattended, especially at dusk and dawn when coyotes are most active. If a pet must remain outside unattended, keep it in a sturdy enclosure with a roof. Electric fences are commonly used to keep livestock in, but they can also be used to keep predators out. They are available at local feed stores, but check to make sure they are allowed in your town or city. Trim and remove any low-lying vegetation and branches which provide hiding places or den sites for coyotes or their prey. Secure garbage containers and put out trash containers on the morning of pickup, not the night before. You can also try products that can be used as animal deterrents like RoPel. Removal is the last resort. 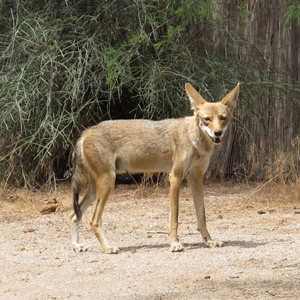 However, coyotes have territories, so removing one coyote only allows another coyote to move into the open territory. Only relocate coyotes if necessary. If it is necessary, consider calling a humane agency which will trap and remove animals for a fee. Contact Southwest Wildlife at our main phone number (480) 471-9109 and leave a message if you would like suggestions for humane trapping companies. I have a javelina eating my petunias. What can I do? Food for javelina can include lush vegetation, many flowers, and succulent plants. To avoid javelina eating your plants, landscape with plants that javelina will not eat or fence around your yard. 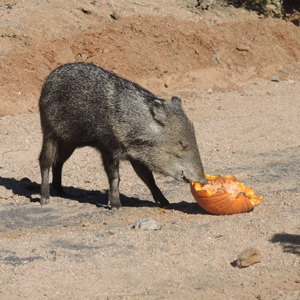 Javelinas’ favorite foods are cacti, succulents, bulbs and tubers, and any plants that drop fruit or nuts. They will generally eat almost any tender, new plants. Bird seed, pet food and garbage can also attract javelina. Javelina may visit your home in search of food, water, or shelter. Do not allow bird seed to fall to the ground, keep quail blocks elevated beyond the reach of javelina, or fence around any bird feeding areas. Store birdseed, livestock feed, rodent bait, and pet food inside. Pick up fallen fruit, palo verde seed pods, mesquite beans and nuts as quickly as possible. Secure garbage cans with locking lids or by attaching them to a fence or wall. Put garbage cans at the curb on the morning of rather than the night before pick up. Javelina will access water by chewing on irrigation hoses or by drinking from a pool or other water source around the home. Javelina will also dig and roll in moist soil during the summer to keep cool. 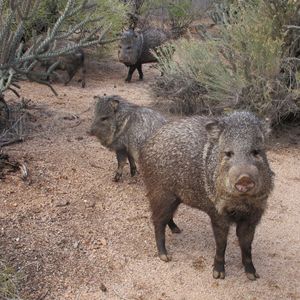 Keep water sources above the reach of javelina or behind strong fencing. Shelter can be a porch, an area under a mobile home, a crawlspace beneath a house, or any other cave-like area. 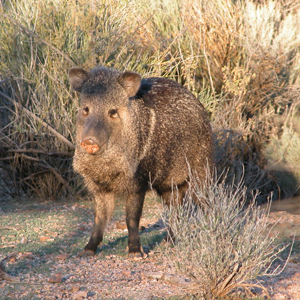 Javelina will seek shade during summer days and warmth during the winter in these areas if they are not properly secure. Use block or solid skirting for mobile homes, decks, and trailers, or use electric fencing. Block entrance holes to any crawl space after the javelina have left. You can spread flour on the ground at the entrance to check for footprints. Electric fencing is the most effective deterrent around gardens; try a single strand approximately 8-10 inches above ground level. It is fairly inexpensive and can be obtained at farm and ranch supply stores. Check local ordinances before installing electric fencing. You can also use block walls or chain link fencing (4 feet tall) around the entire yard, but use a concrete footer buried 8-12 inches into the ground to prevent digging. How do I discourage javelina? Javelina travel in herds, so if you see only one javelina, chances are the rest of the herd is right around the corner, although there are solitary males. Fortunately, as herd animals, you usually only have to scare off one to make the rest of the herd flee. Scare them off by making loud noises, throwing small rocks near them, or spray them with a hose. Feed your pets inside, or only feed what they can eat in one sitting. Keep dogs on a short leash when on walks and avoid low brush, where a herd could be resting. If you see javelina, change your route to avoid a confrontation. Javelina may be frightened by pets and therefore become aggressive, so it is best to keep your distance when with your pets. Also, keep your pets inside a fenced yard to prevent defensive attacks. Javelina will become accustomed to being fed very quickly. They will also become quite accustomed to humans. This can be dangerous for the javelina and humans. Javelina can be extremely aggressive, especially if they have young, so never encourage their presence by feeding javelina. There are recorded instances of people who have been bitten by javelina; however, in each case, the javelina were being fed and had become accustomed to people. If you have javelina in your neighborhood, the best thing you can do is scare them off so they keep their natural fear of humans, and work together with your neighborhood to ensure nobody is feeding. I have a rattlesnake in my backyard. What do I do? 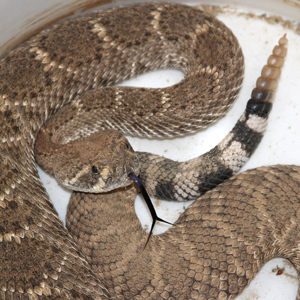 If you see a rattlesnake in your yard, immediately put your small children and/or pets inside. If you want the snake removed, we recommend you call the Phoenix Herpetological Society at 602-550-1090, or your local Fire Department. They are professionals who know how to safely remove snakes. Make sure you keep an eye on the snake from a safe distance (they can strike up to one-half of their body length) so you can tell the professionals where it is when they arrive and they won’t need to search for it. However, rattlesnakes have territories. If a snake is moved too far from its familiar surroundings, its chance of survival is very low. So, if you want to remove a rattlesnake we recommend you not move the snake far—probably less than half a mile—so it has a better chance of adapting to a similar territory. If the snake keeps returning to your yard after you’ve translocated it, and if you have small children or pets, the snake might be a real hazard. You should translocate the snake farther away into a similar habitat and hope for the best. If you do not have pets or small children running around outside, you may want to just leave the snake alone. Once it depletes the supply of rodents in your yard, the snake will probably leave. There are a few things you can do to minimize rattlesnake problems. First, maintain wide, clean, and well-lit pathways along your normal routes in your yard and to your car. Make sure you watch where you walk, especially when first coming out of your house. Second, do everything you can to minimize rodents around your house. Also, rattlesnakes eat birds, so avoid putting out bird feed when it is rattlesnake season. Keep your lawn mowed and low-lying vegetation trimmed up off the ground, so you can clearly see under your landscaping. Lastly, always use a flashlight in dark areas, or when walking at night. If you follow all of these suggestions, and you still have snakes in your yard, consider putting up a barrier wall. The wall doesn’t have to be tall. A three-foot- high wall is sufficient, but make sure it is smooth. Snakes cannot climb smooth, vertical surfaces. Make sure to keep the outside of the wall free of vegetation, and make sure there is no crawl space under the gate. If you have a fence, install hardware cloth where you have gaps or openings in your fence and under gates to help keep snakes out. I think my dog/cat was bitten by a rattlesnake. What should I do? 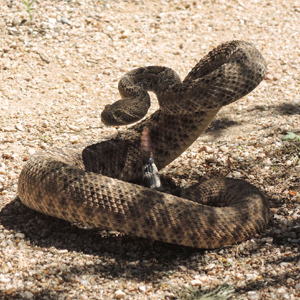 If you see your pet get bitten by a rattlesnake, or if it shows signs of having been bitten (swelling, extreme sensitivity to touch in the area), get the animal to a veterinarian immediately. Your vet will probably ask if you want to treat the bite with antivenin, which is very effective, or if you want to monitor the animal and administer IV fluids to help prevent kidney damage. You can also prevent bites by “snake proofing” your dog. Use only a professional dog trainer that uses a live, defanged rattlesnake in a natural desert setting. Snake proofing may be effective if the snake warns the dog. However, if the dog doesn’t see or hear the rattlesnake, it can still get bitten. Also, check with your vet about the new rattlesnake vaccine. Keep your dog on a short leash when you go hiking to prevent your dog from sticking its nose right into a bush with a coiled rattlesnake in it. A Fed Animal is a Dead Animal. Please do not ever feed wildlife by hand! When people intentionally feed wildlife, the animals lose their natural fear of humans and are more likely to hang around homes. They may become aggressive or be perceived to be aggressive and even dangerous to humans. Feeding a wild animal is a virtual death sentence for that animal and its young. As of September 21, 2006, it is illegal to feed wildlife in Maricopa and Pima counties, Arizona. Birds and tree squirrels are exempt, but feeding these animals can attract larger predators that may, in turn, become problems. It is in the best of all wild animals to make them feel uncomfortable around humans. If they keep their natural fear of humans, they are more likely to live a longer life and less likely to become problem animals. Do you have advice for being safe in bear country? 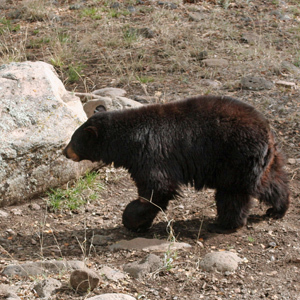 A bear safety information sheet is available to download by clicking the above green link or the bear photo. 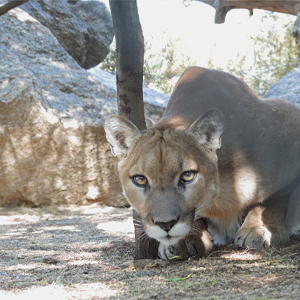 Do you have advice for being safe in mountain lion country? A mountain lion safety information sheet is available to download by clicking the above green link or the mountain lion photo.